Just give me a little chocolate and coffee and I'll be happy all day long! Even with my recent commitment to get healthier and lose weight, I still enjoy my "chocolate fix" because I know it's all about moderation. Available in extra dark, milk and sugar free to satisfy every chocolate lover. Struggling for the perfect gift idea for Mother's Day? Why not indulge the best mom in the world with a box of Guylian Belgian Chocolate Truffles? This giveaway will end June 1st at Midnight EST. I'd love to try the I'd like to try the Milk Chocolate No Sugar Added Bars :) *Thanks* for the giveaway! They are sold in over 100 countries. I would love to try the Chocolate Praline Truffles. I learned that the name is a combination of Guy and Liliane - who knew! I adore their chocolates! Thanks! I learned that, Belgian chocolate is processed, known as conching, to a maximum fineness resulting in a heavenly creamy chocolate texture. I'd like to try the No Sugar Added Milk Chocolate Bar. I love that they have extra dark truffles. That sounds so yummy! I am excited to try their original truffles too, if I win! the European Three Star Superior Taste Award 2010, presented by independent chefs and sommeliers. Guylian Extra Dark Chocolate Truffles were recognized with a near perfect score for their intense and balanced taste, and lingering flavor. yum!!! I would love to try the 22 piece classic truffles! The Extra Dark Chocolate Truffles look amazing!! the extra dark chocolate sounds amazing! I can't wait to try the Guylian No Sugar Added Chocolate Bars. I'm a diabetic so these look really good. Thanks for the giveaway! I learned that they donate a lot of money to help seahorses! Also, I haven't found Guylian in the stores for a long time. I thought I found some yesterday, & was about to buy it, but then noticed that it was an immatator. 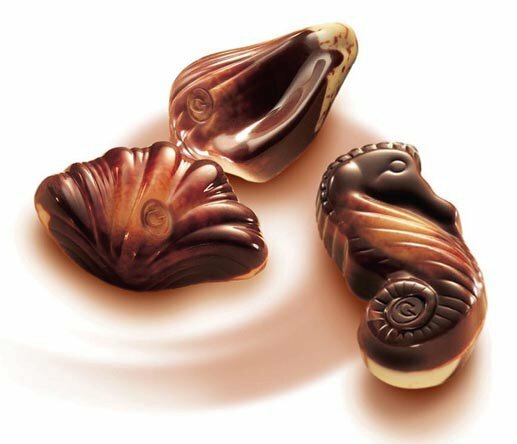 It was another brand of chocolates designed to LOOK like Guylian, but it wasn't the real thing, so I put it back on the shelf. I'd also like to try their No Sugar Added Chocolate Bars! Oh, I'd love to try the extra Dark Truffles. They look so good. I would like to try any of the truffles. I'd absolutely love to get the No Sugar Added Chocolate Bars. They are sold in over 100 countries?! Thats amazing! I would love to try their truffles! I'd like to try the Extra Dark Truffles.